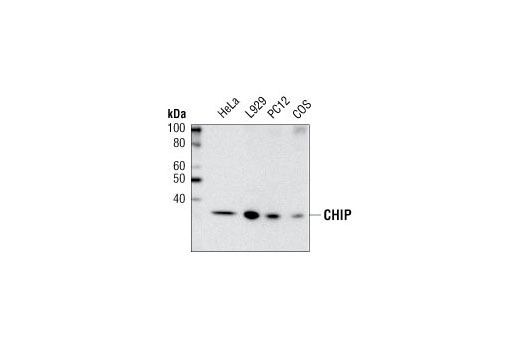 Western blot analysis of extracts from various cell lines using CHIP (C3B6) Rabbit mAb. CHIP (C3B6) Rabbit mAb detects endogenous levels of total CHIP protein. Monoclonal antibody is produced by immunizing animals with a synthetic peptide corresponding to residues around Leu36 of human CHIP. The carboxy terminus of Hsc70-interacting protein (CHIP, STUB1) is a co-chaperone protein and functional E3 ubiquitin ligase that links the polypeptide binding activity of Hsp70 to the ubiquitin proteasome system (1). Cytoplasmic CHIP protein contains three 34-amino acid TPR (tetratricopeptide repeat) domains at its amino terminus and a carboxy-terminal U-box domain. CHIP interacts with the molecular chaperones Hsc70-Hsp70 and Hsp90 through its TPR domain, while E3 ubiquitin ligase activity is confined to the U-box domain (2,3). The binding of CHIP to Hsp70 can stall the folding of Hsp70 client proteins and concomitantly facilitate the U-box dependent ubiquitination of Hsp70-bound substrates (4-6). CHIP appears to play a central role in cell stress protection (7) and is responsible for the degradation of disease-related proteins that include cystic fibrosis transmembrane conductance regulator (4), p53 (8), huntingtin and Ataxin-3 (9), Tau protein (10), and α-synuclein (11). McDonough, H. and Patterson, C. (2003) Cell Stress Chaperones 8, 303-8. Ballinger, C.A. et al. (1999) Mol Cell Biol 19, 4535-45. Murata, S. et al. (2001) EMBO Rep 2, 1133-8. Meacham, G.C. et al. (2001) Nat Cell Biol 3, 100-5. Younger, J.M. et al. (2004) J Cell Biol 167, 1075-85. Jiang, J. et al. (2001) J Biol Chem 276, 42938-44. Dai, Q. et al. (2003) EMBO J 22, 5446-58. Esser, C. et al. (2005) J Biol Chem 280, 27443-8. Jana, N.R. et al. (2005) J Biol Chem 280, 11635-40. Shimura, H. et al. (2004) J Biol Chem 279, 4869-76. Shin, Y. et al. (2005) J Biol Chem 280, 23727-34.